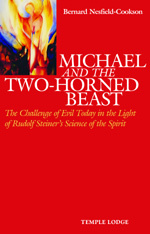 From his spiritual perception Rudolf Steiner described the various forces of evil in our time, as well as their principal opponent, the Archangel Michael. Basing his work on Steiner's teachings, Nesfield-Cookson presents a panorama of forces of good and evil, locked in an epic battle of cosmic dimensions in which we are all involved. He clarifies the pivotal role of the Archangel Michael, the 'Guardian of Cosmic Intelligence', who fights to hold the balance between the key powers of evil in our time - Lucifer and Ahriman - and describes other members of the evil hierarchies, the Sun Demon and the Asuras. He also discusses the biblical Apocalypse of St John, the Mexican Mysteries, the Knights Templar, the Eighth sphere, the human 'Double', and Ahriman's pending physical incarnation on earth. This book is an essential guide to meeting the challenge of evil at the new millennium, whilst strengthening the forces of Light. BERNARD NESFIELD-COOKSON has led a varied professional life as a businessman, school teacher, lecturer and writer. Most recently he was principal of Hawkwood College, an independent centre for adult education. His publications include Rudolf Steiner's Vision of Love and The Mystery of the Two Jesus Children.